This best selling MP3 downloadable album teaches you how to gain mastery over your attitudes and emotions! 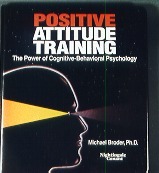 It uses bottom-line explanations, visualizations and imagery, and some of the most powerful exercises ever put on tape! It has been adapted by a wide range of organizations as an essential management tool. In addition to this quite powerful arsenal of techniques for turning around negative moods and changing your life – as well as the way you view it – you will receive a seventh bonus MP3 program called “Your Positive Attitude Booster.” It can be played any time you need a quick reinforcement of the full program.